While Status Quo have a staggering collection of 100 hit singles culled from five decades of work, many fans look back to the 'Frantic Four' era as the peak period. 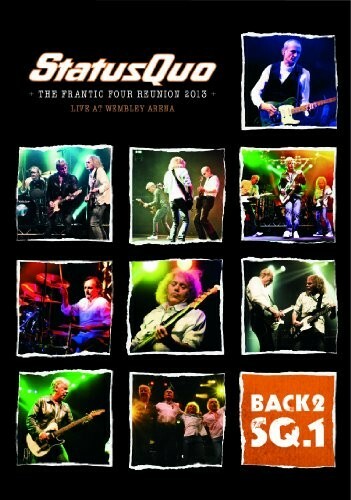 The quartet of Francis Rossi, Rick Parfitt, Alan Lancaster and John Coghlan were responsible for several bonfide Quo classics that the current line up retain as staples of their live set wherever they go. The 'Frantic Four' period ended when Coghlan left the band in 1981. Although Lancaster remained, Quo explored more mainstream avenues with songs like 'Marguerita Time'. After Live Aid, a messy court case ended Lancaster's tenure in the band for good. Quo continued on with Parfitt and Rossi, augmented by Andy Bown, John 'Rhino' Edwards and Jeff Rich, and enjoyed continued success, leaving the idea of the original 'Frantic Four' getting back together as nothing more than a pipe dream. Never say never though – fifty years on from Lancaster and Rossi first forming Quo, a reunion is exactly what happened. Playing a nine date UK tour, this DVD sees them at Wembley performing a set which is based heavily on the classic 'Live' double album from 1976. First impressions are the magic is still there. It's a no frills set up, Rossi is a better guitarist than he was in the 70s and Lancaster steps up to the plate and handles the vocals for 'Backwater' and 'Just Take Me' like he'd never been away. While 'Roll Over Lay Down' and 'Caroline' are surprising omissions, the inclusion of the seldom heard '(April) Spring Summer And Wednesdays' is most welcome. The band really click about an hour in, when 'Forty Five Hundred Times' is unveiled. It's an excellent version, despite being considerably shorter as it morphs into a thunderous rendition of 'Rain' and the awesome 'Big Fat Mama'. While not being at his best vocally here, Parfitt is a monster on rhythm guitar, indefatigable from start to finish. The Wembley show is also available on Blu-ray, while the Glasgow and Hammersmith gigs are available on CD. There is also a limited edition earBook which features all those releases, offset by a lavish 120 page booklet. Rossi alluded to the tour being a struggle due to Coghlan slowing down as the set wore on, and there is evidence of this on 'Down Down' which seems sluggish compared to how it's performed by the current line up – something very noticeable on the Hammersmith release too. Nevertheless, it's most entertaining. I really enjoy Quo's current line up and I enjoyed this. Those who don't care for the bands later output will love it. Essential for those who remember the good old days!